I just wrote an essay called: Prejudice, “Political Correctness,” and the Normalization of Donald Trump. It is my response to all the political center & left pundits who think we should abandon identity politics, "political correctness," and social justice activism in the wake of the latest U.S. election. If you like it, please share widely! Also, it's on Medium, so the more "hearts" it gets (icon at bottom), the more likely it will appear on other people's Medium feeds. So please "heart" it if you like it too! Finally, this essay was made possible by my Patreon supporters — if you liked this piece and want to see more like it, please consider supporting me there. Julia November update: my new book Outspoken is out, plus other stuff! A few days ago, I sent out my latest email update. The big news in it is that my third book, Outspoken: A Decade of Transgender Activism and Trans Feminism has just been released! It collects forty-eight of my previously unpublished or difficult to access trans-themed writings, including my early slam poems and spoken word, essays and manifestos written contemporaneously with my previous books Whipping Girl & Excluded, plus my recent work addressing differences within trans communities and activism. 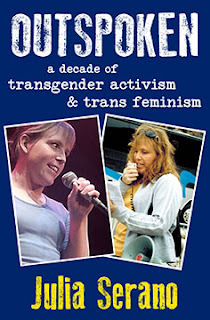 Check out the Outspoken webpage to view the book’s Table of Contents, read part of the Introduction & other book excerpts, and explore the online trans/gender glossary that accompanies the book. At the moment, paperback books can be purchased at Amazon, and it will be available at other retailers & for bookstore/library purchasing (through Ingram) very soon (so stay tuned!). E-books can be purchased at/for Amazon/Kindle, Barnes & Noble/Nook, iTunes Books, Kobo, Smashwords, and other outlets. Another item of interest in the email update is the official release of the Whipping Girl 2nd edition audiobook! It is now available at Amazon, Barnes & Noble, Audible, and other outlets. The update also includes tidbits on my various other projects, plus helpful post-election resources for trans people. You can read the update in all its glory here. If you want future Julia updates emailed directly to you, please sign up for my email list.